6. A 250.00 security deposit is required at check-in for any damages/vandalism caused to the hostel. This deposit will be returned on the day of your departure if no damage is detected. You can leave the deposit by cash or debit/credit card. Cards will be pre-authorized on check in for the full amount. If your deposit is being secured for with a third party credit card we will require written authorisation to be provided by the card-holder. Safestay at Elephant and Castle is located in South London, just five minutes from Elephant and Castle tube station, putting it just a few stops from London Bridge, Leicester Square and Piccadilly Circus. This stylish boutique-style hostel is very clean and features a continental breakfast (£4) and in-room luggage cages. Hostelworld guests have compared it favourably to a hotel. We like the privacy curtains on their beds, which create a sense of personal space even in a busy dorm. Safestay at Elephant & Castle is ideal if you are looking for budget accommodation in London, whether you are seeing the sights in this amazing city or travelling with your family. If Tate Modern, the National Theatre, The Imperial War Museum, the London Aquarium, the London Dungeon, a cricket match at the Kia Oval or clubbing at the world famous Ministry of Sound are on your must-do list, Safestay London Elephant & Castle is perfectly located. 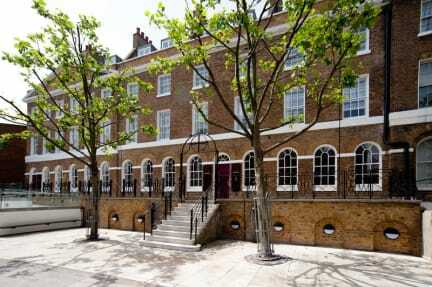 Our beautiful 18th century Georgian building is centrally located, close to London’s mighty River Thames and the restaurants, bars and cafes the Southbank is famed for, along with the London Eye, Borough Market and Shakespeare's Globe Theatre. It's secure, stylish, comfortable and fun, with a heated and illuminated garden for you to relax in. So if you're after budget accommodation in London, bringing a group of school children to study the sights or simply want something different from the usual options in London why not try this fantastic hostel out for size. Close to all the big London tourist attractions, our staff will happily help you plan your visit and give you top tips on what is happening in London during your stay. Free across in our communal areas. Internet terminals also available for a small charge. From the 1st June 2015 our will be enhancing continental breakfast and providing a wider selection of breakfast items. However it will no longer be free and will have an additional cost of £4.00. Travelling with children? Cots are available on request. Please contact the hostel in advance to arrange. Attractions: We sell discounted and fast track entrance tickets to some of London’s most famous sights and best kept secrets. Including the London Eye, Madame Tussauds, The Tower of London, Walking tours, Bike tours, boat trips and many, many more. One of the best hostel out there...The hostel is situated near some good places to have Breakfast, Lunch and Dinner. The Rooms, Services and Atmosphere are Awesome. The only thing i encountered which should be improved is the Internet connectivity. The Range of router should be upto the mark. All the other things were great and gave the value for money. Highly recommended for people those who want to freely roam London without any hassle. The staff at Safestay were extremely helpful and fun to talk to! They were making me laugh my entire stay and went above and beyond to accommodate me. The staff was very nice and the hostel was close to downtown. The rooms were extreamly clean but the WiFi only worked in the lobby. Overall okay experience, needs to improve with cleaning the bathrooms and when it comes to the elevators they'd stop working from time to time. Gross bathrooms. Once I was in the buildings I felt safe. The neighborhood was sketchy. The air in the dorms is super bad, in my case one one did not change their socks for month and it was unbearable staying in the room. After changing the room to different dorm the stink was not so shocking but the air was still and hot. Also quite depressing. Absolutely not worth the money ended up leaving in the middle of the night. The location is not good either.